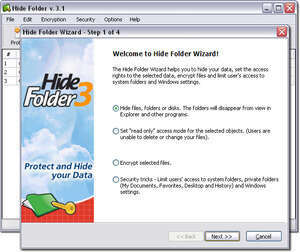 Hide Folder is security software for Windows which creates a secure and easy-to-use system whereby folders and files may be locked and indeed hidden from users without knowledge of or in posession of the password required to access those folders. Setting Hide Folder up is quick and easy, requiring you to simply select the folders you would like to protect and then providing the program interface with a password you should remember for future access. Folders can be setup in a way to make them "disappear" from view of anybody accessing your system and under the configuration menu, you're given the ability to change the password incase your data has been compromised. The latest version of Hide Folder will detect which version of Windows you're running and tailor the setup of the application to suit whatever that version may be, ie. Hide Folder 4.7 is a shareware program and can be used as a demo to try the software until the free trial period has ended. A full version of the program is available after the trial period ends. For security reasons, you should also check out the Hide Folder download at LO4D.com which includes virus and malware tests. Additional screenshots of this application download may be available, too.